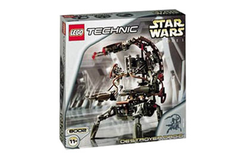 The 8002 Technic Destroyer Droid is a TECHNIC Star Wars set of a Destroyer Droid, otherwise known as a Droideka. The model can be folded up, and when rolled along it will open and stand up. This function is powered by a number of elastic bands. This is a description taken from LEGO.com. Please do not modify it. Build your own destroyer droid! And it will do what you command! This combat machine moves into position in an armored "wheel" configuration and then unfolds to become a terrifying weapons platform. They have twin blasters in place of arms and can generate their own deflector shields. Even Jedi Knights fear the destroyer droids! Ages 11+. 553 pieces. Facts about "8002 TECHNIC Destroyer Droid"
Build your own destroyer droid!